CWB 2018 - Be your true self! 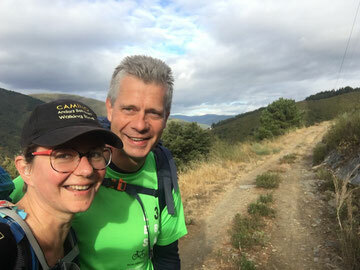 Since 2015, Foundation Anders Bekeken organise a pilgrimage to Santiago for people with a visual impairment. For the fourth time we have walked this path in October 2018. Please let us introduce our team and what the motivation and experiences were of the walkers and buddies. Walkers: Toos Schippers, Annet Fokkens, Amory Geerling, Pascal Wirken and Evelien van Soest. Buddies: Monique Olsder, Carla Broers, Joke Franken and Joost van Uijtert. Organisation: Séverine Kas, Jantina de Vries and Gert-Jan de Hoon. "Ever since my childhood I am visually impaired. When I was 15, I was told I would be blind within a year. In reality it went a bit slower. Slowly I have lost my sight. Six years ago I had to stop working. Every time I had to stop something I loved, because of the problems with my eyes. When I got incapacitated, I was almost looking forward to be completely blind. I was getting tired of every time letting go of something and adjusting myself. I wanted it to be over. Done with giving in, and looking forward to build again. Two years ago I lost my vision. I always thought, that after I would be completely blind, I would pick up life again. It didn't happen. My situation at home is that I am a house father flowing with the experiences of my wife and children. I am able to look after myself and I can fill my days. I am realistic and positive. But to be honest, I have lost myself." "Something is set in motion. I experience a small fire inside myself, ignited by the Camino. I dare to dream again. The fears that kept me from doing things in the past are still there. They are not gone, but instead of holding me back it is keeping me sharp. There is a deep longing to explore, to dream, and to take risks. Such a good feeling to feel alive again and not just surviving." 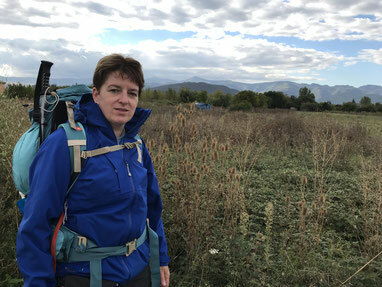 "I have heard wonderful stories about other editions of Camino Walking Blind and it really triggered me. I love walking and I am always in for a good challenge. What I like about this project is walking intensely together for two weeks and being someone's buddy." "My most inspiring moment? I find it hard to capture this in one moment. 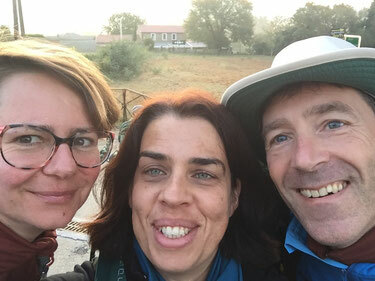 For me Camino Walking Blind is about walking as a team, intense conversations, the difficult parts we have walked together, and meeting with other pilgrims." "Since birth I am visually impaired. Because of a rare eye disease (Aniridie), I miss the iris in both eyes, which makes me very sensitive to light and I always have to wear sunglasses. My vision is about 5%. Walking the Camino means stepping out of my daily routine and it feels like coming home with myself. My whole life I am trying to deal with the consequences of my visual impairment. It makes me self aware in what I can, what I need and what I want to achieve. I am very perseverant and I enjoy the small things in life. On the Camino I am looking forward to be free and walk open-minded enjoying nature. Just having to look after myself, I want to try to push my boundaries and being more in tune with my intuition." "The Camino has refreshed my mind. I am looking forward to start new things, I have a new power. The experiences I carry with me help me forward on a daily base. I have the feeling I am allowed to be here. I have more self compassion and I take my time to stay in the present. New steps I want to take I can also discuss with my family now. I can start working on my next goal." "I have Usher Syndrome (deaf blind), this is a progressive eye disease. I am almost blind and deaf, my hearing is being compensated by two cochlear implants (CI's). As long as I have heard and read about the Camino, I have a longing to walk this path myself. But I hadn't signed up for Camino Walking Blind earlier, because next to my bad sight, my hearing was very bad upto a year and a half ago. I thought I would not be able to get something out of it and give to other people. With a second CI my hearing has improved a lot and I am able to communicate within a group." "I will absolutely continue walking long distance walking paths in combination with deep conversations with fellow walkers. Most important, in my contact and walking with buddies I have experienced to feel more human than visually impaired, I can not tell you how good this feels. Also, I have learned that I am much stronger in a mental and physical way than I had expected." 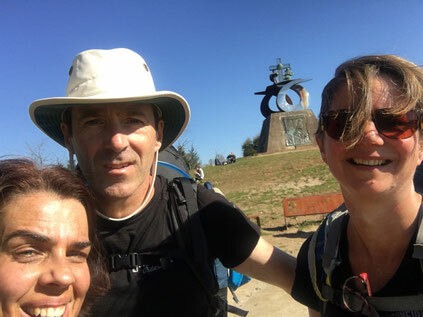 "Walking the Camino is like a wish coming true, and since I was a young girl I have been fascinated by this pilgrimage to Santiago. 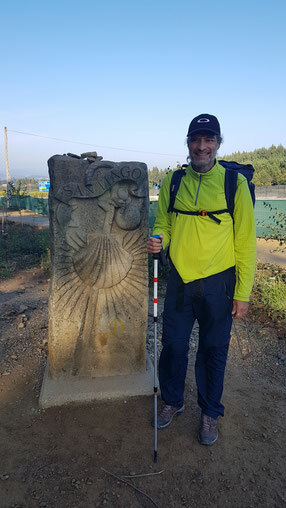 To share part of my life journey walking with Camino Walking Blind means the fulfillment of my wish, but also to make the world a better place by guiding another human being on part of his/her path. It also means sharing life experiences and listening to the story of others, being a mirror for my companions and looking into the mirror myself, learning from others. This summarises my expectation for this journey." 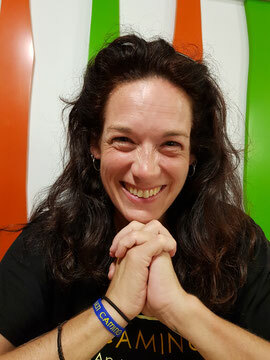 "I have learned to deal with not knowing what the Camino would bring: in the morning you don't know where you sleep in the evening, you don't know who and what you will meet that day, you don't know the condition of the path, you don't know if you will be walking with rain or sunshine, you don't know what you will eat for your next meal. I was surprised and startled, but most of all I ENJOYED!" "I have started to walk long distance walking paths to experience more peace of mind, during a very busy work period in 2015. I have walked several paths in the Netherlands. Walking has made me more aware of nature and my surroundings, I observe in a better way and I am more in the present. Personally I am very curious how to strenghten this by explaining to the walkers where we are walking and to share this with others." "I am visually impaired since birth, and almost blind since two years. Practically spoken it is best to consider me blind. 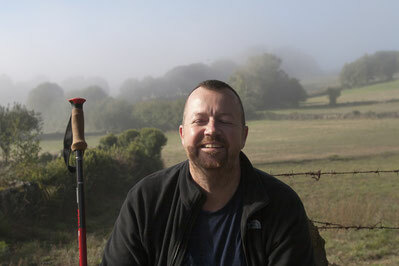 I would love to join Camino Walking Blind, because I tend to choose for the comfortable not doing. Two weeks on a journey in an unknown surrounding, with people I don't know and whom I am going to depend upon, for sure will be a big challenge. Walking every day will offer a nice opportunity and might shine a light on this insight, through inner reflection and possibly by conversations with others. I know from experience that traveling with a group of strangers encourages openness and most of times have a unique dynamic. Also, walking the Camino would fulfill a long cherished dream. What I hope to achieve walking the Camino, is to get closer to the emotional knowing of what I already know in a rational way, that people appreciate it when you take your own space." 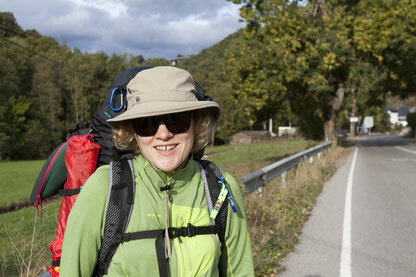 " Being visually impaired, I have realised that you can walk the Camino two ways. You can torment yourself mentally by continuously being aware that you can't walk the Camino independently and this way you will never be able to meet yourself on the path. And feeling extremely frustrated that others have to do everything for you and you have to wake someone up in the middle of the night to go to the bathroom. 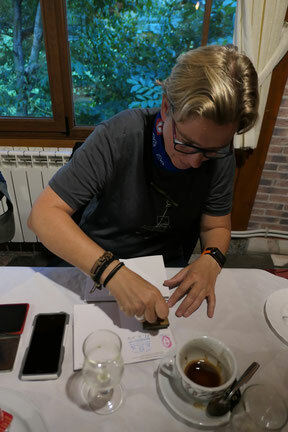 Or you can be happy that you are walking the Camino, every now and then reflecting with your buddy, enjoying his/her helpfulness and company and complimenting yourself that you are able to find a toilet by yourself in the middle of night." I am almost blind in my left eye. Right I can see 20-30% with a field of view of 60 degrees. I have a mailbox vision, and in this tiny split I see sharp close by. By chance I saw a post of Camino Walking Blind on Facebook. Inmediately I thought, this is for me. It will be hard work, a lot of crying, laughing, talking, singing, being quiet, but this chance I won't let it pass by. Life is short, fragile, as I have experienced. I want to do everything that touches my heart and makes me happy. I have experienced a near death during a transplant operation in 2014. This has changed my life permanently. During this experience I have partially lost my sight. I know what it is to fight (for my life), to learn to talk, eat, and walk again like a baby. And suddenly you are visually impaired. How do you deal with it? I am very much aware of the fact I have a new and different life. A second chance not always given to others. It is time to heal, to leave these traumatic experiences behind. Also the spiritual aspect of this journey attracts me a lot. I want to heal, I want to grow, I want to get closer to my true feelings. Not to be afraid any more for this voice inside my head making me doubt and feel small. Enough! I am very scared and that is why I am writing this motivation letter." "The most inspiring moment was letting go of my 'safe' walking sticks, trusting and walking free with a sim (a metal frame to hold on to in between walker and buddy). Then making another step, walking without sim! My first steps were very careful and gradually I got confident walking independently with my buddy close by. It felt truly liberating. I see it as a metaphor for the rest of my personal development and growth. Trusting and this way receiving trust. The past year I have learned to listen more to my intuition, with the result that I have made important choices. Because of this I am making new steps in my life, literally and figuratively. With this awareness I have had the idea since to make an inspiring walk. An item about 'Camino Walking Blind' on local tv and reading about it on the website made me curious. How would it be to be part of such a group? Could I have an added value to the purpose of a new group. What could I find out about myself and what is 'my path'? Thinking about walking the route together gives me goose bumps. The fact that so many, each with their own intentions, have been walking here is almost magical. 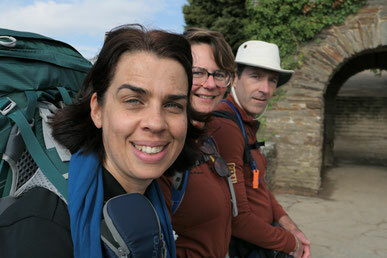 I have the feeling that preparing this together, walking and reaching Santiago will be an enriching life experience. I will expect this to be a journey we will never forget." "It was a most wonderful experience, I would say life-guiding. It has given direction to my life, in the moment where I am now. I have marked CWB2018 as a milestone to look back on my achievenments of the past year and to look forward to what I want to do, feel and know." Jantina de Vries was a buddy in 2016. 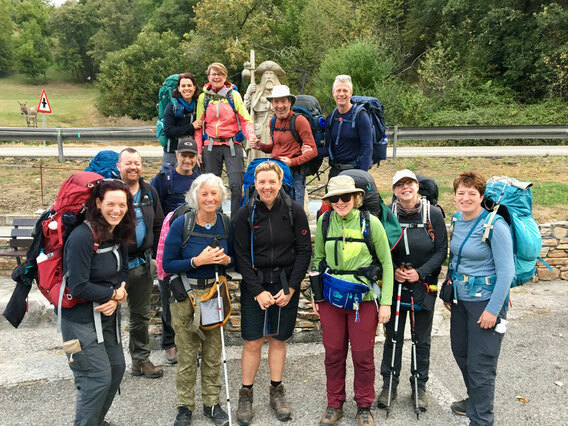 The curiosity of how it would be walking the Camino for some time, and carrying all essentials on your back was stronger then the hesitation to be part of a group of strangers for two weeks. It was an amazing experience. It was beautiful to be part of this team, and to share life for some time: looking after each other, caring for the other, sharing bunkbeds in dormitories, adjusting your walking pace, laughing and crying together, giving and receiving. I am very happy I was part of it." 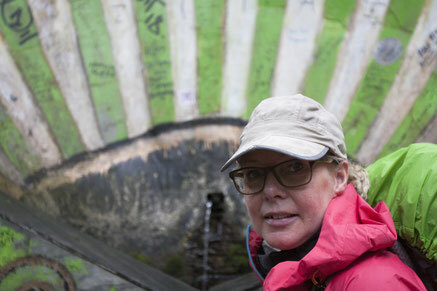 This year she will be part of the organisation of Camino Walking Blind.